Is the Razer Cynosa Chroma Pro supported by Synapse 3? How many lighting zones does the Razer Cynosa Chroma Pro has? The Razer Cynosa Chroma Pro is individually backlit and comes with a total of 104 LEDs found under each key for full customization. Is the Razer Cynosa Chroma Pro water resistant? The keyboard is designed to resist accidental water spillage, but can't be submerge under water. What is Chroma Lighting and where can I find out more about it? Chroma by Razer represents more than just multicolor, it opens up limitless personalization options. To find out more about Razer Chroma and Full Spectrum Gaming, please visit https://www.razerzone.com/chroma. What type of switch does the Razer Cynosa Chroma Pro use? The keyboard features gaming grade keys with a soft cushioned touch and comes with full height keycaps for a solid and responsive keypress with every click. How do I customize the Razer Cynosa Chroma Pro backlighting? The Razer Cynosa Chroma Pro backlighting are fully customizable using Chroma Studio on Synapse 3 device configurator software. Chroma Studio offers 16.8 million color options and multiple lighting effects to choose from, allowing you to mix and match your keyboard lighting just the way you want it. Can I turn off the Razer Triple Headed Snake Logo that is at the bottom of the Razer Cynosa Chroma Pro? Yes, the logo lighting can be turned on and off in conjunction with the back panel lighting. Can I program the "FN" key on my Razer Cynosa Chroma Pro? You cannot customize the function of the FN button. This key is used for various functionalities including on-the-fly macro recording, changing keyboard LED, switching to gaming mode etc. How do I remove the key from my Razer Cynosa Chroma Pro? Razer does not recommend removing the keys from the Razer Cynosa Chroma Pro. Excessive force can damage the key itself. If you desire to clean under the key, Razer suggests holding the unit upside down and/or using compressed air from a can. Can I use On-the-Fly Macro Recording without installing the drivers? Do I have to keep the application running by keeping the system tray icon open? On-the-Fly Macro Recording only works when the driver is installed and running in the background. The system tray icon should show up in the Windows Taskbar. If you start the recording without the drivers or the system tray application, the LED for the On-the-Fly Macro Recording on the Razer Cynosa Chroma will blink three times and go off instead of remaining lit. Please install the driver and allow the system tray application to run in order to make use of this recorder. Profiles are templates that are used to define a keyboard's settings for different games or applications. These customization options can be saved into profiles via the driver menu. This allows the user to fully customize the keys to suit each different game and application. The gamer could require different sets of macros, for example, for different games. The user can then conveniently switch between various saved profiles, saving the hassle of reprogramming the keys each time you launch a game. Do I need software drivers to use the Razer Cynosa Chroma Pro? You may use the standard keyboard functions by simply plugging the Razer Cynosa Chroma Pro to any available USB port on your computer. However, you will need to download the software and drivers in order to enable advanced features such as macro recording and profile settings. Does the Razer Cynosa Chroma Pro have anti-ghosting capability? How about N-key rollover? 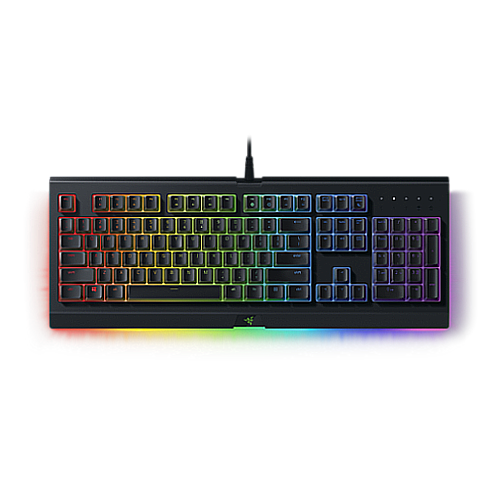 Yes, the Razer Cynosa Chroma Pro features a gaming optimized key matrix that allows the recognition of up to six(6) simultaneous key presses. N-key rollover (NKRO) only works with a direct connection to a native PS/2 port on the computer which provides for other limitations that USB overcomes. The Razer Cynosa Chroma Pro's gaming optimized key matrix serves a similar purpose while using an ordinary USB port.